Donors to the Foundation who have supported work of the Foundation by contribution with an accumulation of $5,000 or more up to $10,000 are recognized as Partner of the Foundation. That membership is recognized with a Bronze salmon figurine on the Foundation’s recognition wall. First of all, the reason for any donation I’ve made to this hospital is it’s pay-back time for my frequent use of it’s facilities and the top-notch care provided!. said Alli Graham as she gave her reasons for becoming a Partner with the Shuswap Hospital Foundation. Alli was born in Chase March 10, 1924, her first three years were in Sqiulax, then Cambie, near Sicamous which was home from 1927 to early 1952. Alli worked at several temporary jobs in early adulthood and by early 1952 after the death of both parents in 1943 and 1950 she had to leave for lack of resources. On January 1, 1953 Alli began as housekeeper for Floyd Graham, a divorced man with 3 children who were aged 11, 8 and 6. The Graham era became permanent with their marriage in December of 1955 and two more children were born January 1957 and May 1958. With Floyd’s retirement as railway engineer in 1980, Floyd and Alli moved back to Cambie and in September 1999, due to failing health Alli & Floyd acquired a condo unit in mid Sicamous. Floyd passed away suddenly on January 1st 2007 and Alli spent time learning a new style of life alone, new social life, new friends. Alli wrote a book called ‘Life Is What Happen’ which provides a wonderful history of her 94 years here in the Shuswap. At the Shuswap Hospital Foundation we are so very grateful for the most generous support of our newest Partner, Alli Graham. Daryl and Donna-Lynne were born in Regina, Saskatchewan. Daryl was raised in the city of Regina, and Donna-Lynne grew up on her family’s farm just outside Edenwold, Saskatchewan. They met in their 20’s when Donna-Lynne was a teacher, and Daryl had recently become a member of the RCMP. They were married on Donna-Lynne’s family farm, then moved to British Columbia where Daryl was posted with the RCMP. 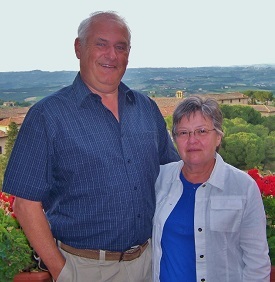 They raised their family of three children (Jarrett, Tyler, and Jenna) in the communities of Kelowna, Keremeos, Dawson Creek, New Hazelton, and Sicamous – eventually choosing Sicamous as the community where they retired. Daryl and Donna-Lynne shared love, humour, strength, and kindness with their family and friends. They are remembered as animated story tellers and great listeners. They kept us laughing and smiling around dinner tables, fires, and soaks in the hot-tub. They enjoyed traveling throughout Canada with their family as well as Europe, Hawaii, Mexico, and the Oregon Coast with each other. Daryl and Donna-Lynne were extremely grateful and very thankful for the care they received through the staff and services at Shuswap Lake General Hospital when they needed it. They always said how fortunate they felt, despite their battles with cancer, that they lived in a place where these services were available to them. Daryl passed away on January 22, 2014 and Donna-Lynne passed away on June 01, 2016. Both had instructed that a donation be made to the Shuswap Hospital Foundation in their honour, and also requested that their family and friends do the same. They took comfort knowing these donations will improve the life of someone else. Daryl and Donna-Lynne, we love you and miss you beyond what words can express. The gentle presence of your beautiful souls will remain forever in our hearts and minds, and give us comfort as we move forward. We will always think of you, and find strength. As you taught us, life is beautiful, live it to the fullest with those you love. Dr. Cedric Low Memorial Tribute. What an indescribable loss when Cedric passed away on August 18, 2014, after a courageous battle with cancer. Cedric was a remarkable man who reached many people throughout his life, as a son, sibling, husband, father, uncle, dentist, colleague and friend. His passion for living was evident in his dedication to his family, his dental practice and to life itself. Cedric is loved and will be missed forever by his wife Pam, his son and daughter-in-law Jonathan and Sarb, his son Christopher, his daughter Rachel as well as his sisters Dawn and Wendy, and brothers, Roderick and Andrew. Cedric’s extended family and friends will also miss this exceptional man. Cedric will always be remembered for being a beautiful soul with a big heart, a magical smile and a wonderful sense of humour. One of his favourite songs was Harvest Moon by Neil Young. Whenever you see the moon, think of Cedric and feel his radiance which lit the lives of many. Duncan Myers has enjoyed a varied life with many interesting occupations. As a young lad he entered into the culinary profession having been trained in what today would be recognized as restaurant management. His training was in Britain but his apprenticeship was served in the hotel industry in the Alps. He moved on to working the same skills in the motion picture industry operating the food services on movie sets on location in the desert, for films like Lawrence of Arabia and Doctor Zhivago. The locations took him to some exotic places including a session in Spain. He was attracted to Canada through a family connection and emigrated to Canada in 1966 landing in the Vancouver area and accepting a position in charge of the catering services at the Point Gray Golf Course. Through a contact there he was recruited by Block Brothers to the same kind of position at their Mile 108 development. Being a natural in dealing with tourists he soon took responsibility in the Tourism sector and became the manager for tourism in the Cariboo. This is where he met and married his wife Esme, who was ‘Miss Cariboo’. They went on to raise two children. His reputation in the Tourism industry was recognized and he served for a time in the Yukon in the same capacity. 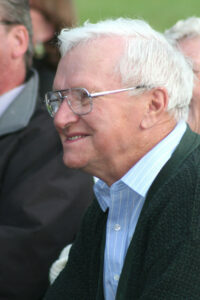 Duncan served many years in the Thompson and Shuswap tourism organizations. Through his work he traveled the continent and abroad spreading the good news of the area at trade shows and events. He worked diligently to help develop the Tourism Industry in BC and received recognition from the provincial authorities for his leadership, having been awarded the William Van Horn Visionary Award. In this area he was the leader in creating the ‘Last Spike’ historical marker and high interest tourist attraction at Craigellachie BC, near the entrance to Eagle Pass, at the site where East and West met when the CPR railway connected, on November 7, 1885, its east and west developments. Always very involved in his community Duncan over the years was a member of Kinsmen and Rotary. He served as President of the Salmon Arm Rotary Club in 1990/91. Duncan was recognized by his club and received the designation of Paul Harris Fellow. He continues to support and contribute to the Rotary Foundation. In 2005 Duncan accepted an appointment with the Shuswap Hospital Foundation to serve as Development Officer or Fund Raiser. And as they say the rest is history. Duncan showed his talents and dedication over the years that followed. Successful campaigns were conducted each year and benefited from his talent and imagination. He played a key role at all times. A man of many talents and an outstanding photographer, his work often became part of the promotions for the foundation. Duncan’s talent and dedication in tourism and with the Hospital Foundation was recognized and he received not one but two of the Queen’s 60th Anniversary medals as recognition. One presented to him by Member of Parliament Colin Mayes and the other by MLA George Abbott. Duncan’s generosity is also recognized by the Foundation as a “Benefactor’” to the Foundation and at the Annual meeting of the Foundation in 2013 Duncan was granted Honorary Life Membership in the Foundation Society. In 2011 William Pringle lost his 88 year old soul mate Sybil to stomach cancer at Shuswap Lake General Hospital. Together they had a wonderful life, raising two great kids who provided them with great grandchildren. William’s wife Sy was an avid golfer and won many awards.During their life together they experienced living in places such as Turkey and Pakistan and visiting a number of other countries including most of Europe, the Far East, Asia, Austrailia, New Zealand, South America and the Galapagos. William and Sybil Pringle took many trips to the United States and Mexico as they enjoyed their time together. William says “as I look back over our life together, I know I was fortunate to have such a loving wife who I miss very much at this time of my life”. William wrote a book about his life with his soul mate and entitled it “Enviable Life”. Shuswap Lake Senior Citizens Soc. Walstow, and we thank them for their most generous support. Ted Whitehead, 86, died on January 7th, 2015 at the Salmon Arm Hospital. He leaves his wife of 62 years, Eileen (Laing) Whitehead; 3 daughters, Leslee Lucy (Jim Adams), Susan Bondar (Brian), Judy Collins (Colin Campbell); 3 sons, Bob Whitehead (Sue), Mike Whitehead (Diane) and Ken Whitehead (Rena). He also leaves 16 grandchildren, 25 great-grandchildren, sister-in-law Mary Edmiston and many nieces and nephews. Ted was born in Miami Manitoba on April 28th, 1928 and raised in Roland Manitoba. In 1946, he moved to British Columbia with ambitions based on memories of a poster he had seen in a Greyhound bus terminal showing the Big Bend Highway. After his move to BC, he worked as an electrician and managed to collect some personal wealth – a new Cadillac convertible and a motor cycle. This is when he met his future wife, Eileen. She was a young nurse in training, born and raised in New Westminster. They were married on October 3, 1952. Through circumstance, Ted became a logger. After one year of marriage and the first baby, Leslee; they moved to Nelson Island, an isolated area on the Sunshine Coast near Pender Harbour. Ted and Eileen spent the next 4 years on the island. Ted was driven to learn his new career of logging. Two more babies were created on the island, Susan and Bob. There was a collapse in the log market and they were forced to move. Ted purchased a saw mill and logging camp in the Caribou. This was another remote area which was on the west side of the Fraser River. The family now included Mike, baby number 4. Soon after the acquisition of the saw mill, lumber prices totally collapsed into a recession. Around this time, Ted and Eileen had a chance to visit family in Sicamous. Eileen told Ted, “I don’t know where you are going to live, but I am not leaving here. Find some way to make a living”. Ted and Eileen moved to Sicamous in March of 1961. Shortly after moving there, Judy was born, baby number 5. Ted did find work. He became a mechanic during the construction of the Roger’s Pass Highway. Meanwhile, Ken arrives as baby number 6. Ted carries on with many careers including: supervisor of mill construction, house building, mechanic shop, gas station, logging, steel fabrication and site preparation for reforestation. A highlight during Ted’s work life was supervising the construction of a plywood plant in Columbia, South America in 1970. Ted finally retired at 72 years old. He took on the hobby of woodworking during retirement and created many wooden items for the family. Ted and Eileen travelled across Canada and into the north many times. Ted helped with the creation of the Sicamous Curling Rink and was on the Water Board for several years. He leaves many stories behind and was able to laugh at himself. In lieu of flowers, memorial gifts may be made to the Shuswap Hospital Foundation in Ted’s name. Ted was looked after extremely well by the staff and doctors at the hospital. 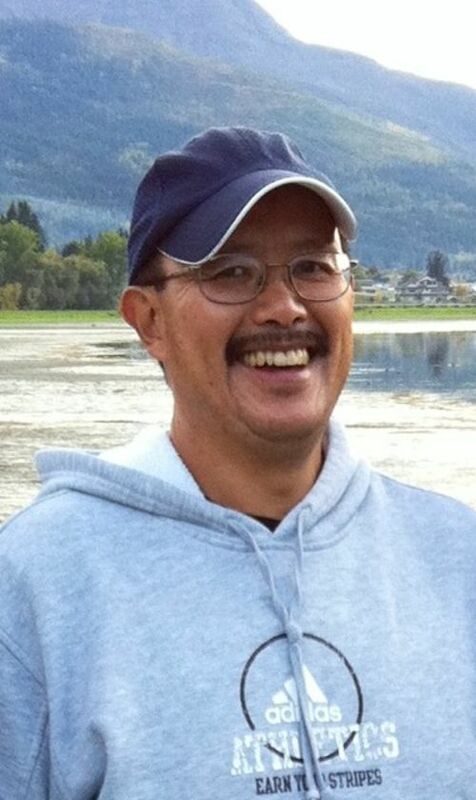 There was a memorial held in Sicamous on January 17th to celebrate Ted’s life. Dr Ralph Williams, affectionately known to many of his patients and friends as ‘Dr Ralph’, served as a family practitioner and surgeon in the Shuswap from 1955 to1995. Dr Williams was surgically trained in Winnipeg and came to the Shuswap for a short term replacement and simply stayed.In his long and distinguished career Dr Ralph worked for the betterment of medical care in Salmon Arm and proudly watched the changes and improvements to the hospital as its chief of staff over an eight year period. The medical community grew from four physicians when Dr Williams arrived to forty five shortly after he retired. As the only doctor with post graduate training, he took on general and orthopaedic surgery, obstetrics and a non-stop on-call schedule 365 days a year. After the loss of his first wife, Dr Williams married Addie, the Director of Nursing, at the Shuswap Lake General Hospital. Both were very active in the community. Both loved the outdoors and spent many a summer working from their cottage on Shuswap Lake. Over the years Ralph was a member of Toastmasters, Kinsman Club, K-40m, and Salmon Arm Rotary, where he served a term as President. He was also a director of the BC Lung Association for a dozen years. Dr Ralph and Addie were always generous with their time and resources. The Shuswap Hospital Foundation is pleased to recognize Dr Ralph Williams and his wife Addie as Partners of the Foundation.